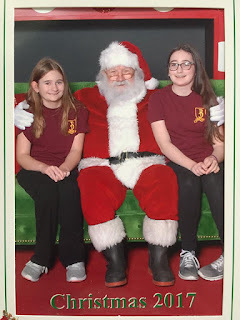 Yesterday I took Valerie and Veronica to the mall for their annual Santa picture. Oddly enough, yesterday on my Timehop app, was their very first Santa picture together. 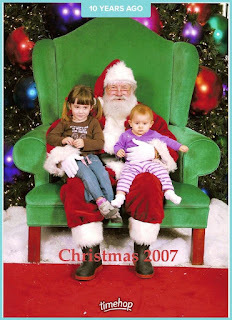 They've changed a bit, while Santa looks the same! We've had the same mall Santa for years now. This year they changed up the backdrop which I am not crazy about. It looks okay in person, but see that black thing behind Santa? It's actually a giant chimney/fireplace. You can't tell that AT ALL from the picture. The older pic with the chair and tree looks so much better. No telling who decides these things. Our mall actually isn't decorated one bit. Usually there's garland hanging all over and decorations here and there. Behind Santa is usually a blocked off area with fake snow and over sized toys. This year there is nothing. Seriously, nothing festive anywhere. Our mall is pretty bad; we don't even have a food court or anchor restaurant anymore. Sears closed and that entire wing is dead. If it wasn't for JC Penny and Dillard's, I'd never go there at all. I noticed that around here there are fewer businesses that have decorated. I miss it. The Santa picture is great though!